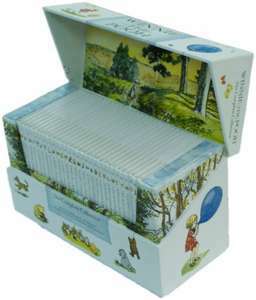 The full collection of 30 glorious and enchanting tales from Hundred Acre Wood, the Winnie-the-Pooh collection from the brilliant A.A. Milne is presented in a unique gift box. Featuring all of Christopher Robin’s exploits, these charming hardback stories are enduring literary classics that are bound to delight all ages. Packed full with the adventures of Winnie, Tigger, Piglet, Eeyore and the gang. A wonderful collection of beautiful books. Ordered. Nice find, thanks OP!